Size: 5.2" x 3.1" x 1.5"
Texas Instruments announced September 17, 1971 the "calculator-on-a-chip" and Bowmar/Ali Inc. of Acton, Massachusetts, USA. introduced the famous 901B "True-Pocket-Size" calculator based on the TMS0103 with a suggested retail price (SRP) of $240.00. It took less than one year before Texas Instruments announced the TI-2500 Datamath calculator in April 1972 with a SRP of only $149.95, its delivery in June 1972 to first customers in the Neiman-Marcus and Sanger-Harris department stores in Dallas, TX and its formally introduction on September 21, 1972. The SRP of the TI-2500 was reduced to $119.95 by the date of its introduction. Dismantling the featured Bowmar 901B manufactured in February 1972 reveals not only the TMS0103, but four Texas Instruments display drivers, the original Klixon™ keypad and a Bowmar made Opto-stic LED display. Compare this Bowmar 901B with the Mariner NRC7200 sporting LED displays from Monsanto. Digging in the history of portable electronic calculators? Don't miss the Sanyo ICC-804D, Sharp EL-8 and Rapidman 800. 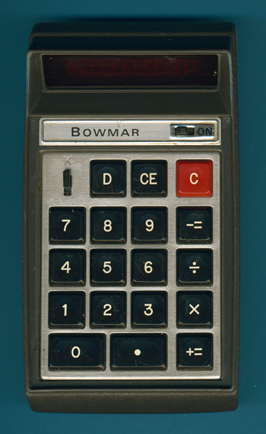 Later with the Bowmar 901D a similar calculator with a 10 digit display was sold. This calculator was sold under different labels, beside this Bowmar 901B it was popular as Commodore C110 and Craig 4501, too. A very similar design was introduced by Columbia with the Scientific. Don't miss the minirex 73, the eastern copy from GDR company RFT and the Heathkit IC-2009. The Litronix Checkmate looks similar but is completely different. Compare this 901B with later products like the MX-55.